Have you heard of the Quilt Halo? 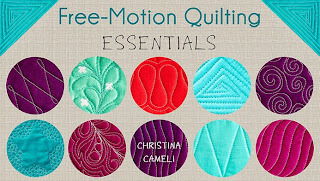 While investigating tools designed for free motion quilters, this one caught my eye. It is so simple; a plain, red, weighted circle with a rubbery coating that lightly grips a quilt top. The minimal design makes it look like Ikea had a hand in it (it was actually designed by quilter Sharon Schamber). The Quilt Halo is intended to help you grip and guide your quilt without gloves during free motion quilting. I asked the makers for a Quilt Halo to try out and they agreed! I tested it with some practice stitching and off and on for the quilt along. To use the halo I slid it under my darning foot. I was excited to be able to start quilting without having to figure out where the toddler took my quilting gloves! I immediately noticed that my hands felt more relaxed than when I flatten them against the quilt surface, as I do when quilting with my gloves. It seems just as easy to maneuver the quilt with the halo as it does with my hands, and sometimes I felt that I had better control with the halo than I do with my hands, probably since my hands were in a more natural position. There is a wider area to work within the ring than with how I normally place my hands, so I didn't need to stop and reposition as often as is typically necessary. This lent a nice flow to my stitching. While stitching I occasionally found that the ring would bump into the back of my darning foot even when it seemed like there should be room for me to stitch. Remembering to allow for some space in the back between the foot and the ring was hard for me but I did get better over time. The picture below shows the point at which the foot would begin bumping the ring. The only serious difficulty I had with the halo was how it behaved at the edges of the quilt. To stitch along the edges of the quilt one side of the ring would be off the quilt top. The grip along this edge was therefore reduced and sometimes the batting would slip out from the halo's grip, making it hard to keep the top flat. Additionally, while the halo exerts downward pressure on the quilt top, it is not possible to apply outward pressure as I can with my hands. This made me feel nervous if I worked in an area with seeming extra "fullness" in the fabric. While no puckers actually developed during my test drive, it made me feel apprehensive to not have the same amount of control as I do with my hands. Again, this problem was worse on the edge where part of the ring was off the quilt top. The perfect solution for this problem would be to only use the halo in the center areas of the quilt and to use my hands on the edges. That's fine if you're working with borders but my quilts often don't have them. And unfortunately, once you've started stitching with that ring under the foot, you'll have to stop and cut the thread to get it back out. I did not have any problem with the halo bumping against the right edge of my machine, but if you have a smaller space under your machine arm you might encounter that issue. Also, I was only quilting a small quilt so I don't know if there are any problems that might arise with a larger quilt, where you have more bulk under the machine arm. I enjoyed the opportunity to use the Quilt Halo, but I didn't feel it improved my stitching. 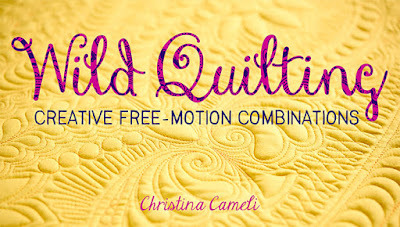 I would recommend the Quilt Halo for someone who is not satisfied with the grip they currently have on their quilt top while free motion quilting. If you suffer from joint problems or pain, the Quilt Halo might allow you to be more comfortable or to quilt longer. You'll have to figure out how to manage the quilting along the outermost edge of the quilt though. If you'd like to be entered in a giveaway for your very own Quilt Halo, leave a comment below. Make sure I have a way to contact you if you win. International entries are welcome. I'd be interested in hearing if any readers have tried the Quilt Halo. What did you think? Entries for the giveaway are now closed. I have seen one of those before but I would love to try! Part of what is keeping me from freemotion quilting is the fear from not being able to completely control the quilt under the needle and the halo seems to sove that. I have seen those and always wondered what they are like. I'd love to try one! I'm having more arthritis stiffness in the morning, so I would like to try one of these to see if it will help me. Hi, Christina: That was a really good review you gave of the product. I like when both pros and cons are mentioned. I've never tried a Quilt Halo but sure would like to! This looks neat. I'm not much of a gadgety girl, but I think I'd like it. Thanks! An alternative to the halo, which I quite like, is a circular wooden embroidery hoop. This goes beneath the quilt on the bed of the machine and then your hands rest on the rim on top of the quilt. Hard to explain but hopefully you get the idea. That looks cool, I've never heard of it before. I would love a chance to win one and try it. I would sure be game to try it if I won it! Thanks for the giveaway. What a wonderful thing! Count me in! i'd love to win this. 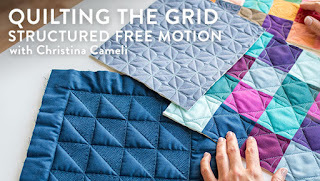 i love free motion quilting, but i feel SO tense while i'm doing it, even with gloves on. Just heard about the Halo the other day. Sounds like something I would like. Anything to improve FFQ. Great review! 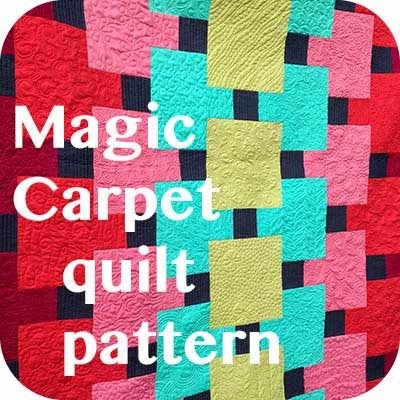 I'd love to try anything that may help me FMQ! Thanks for the thoughtful review and the chance to win. Thanks for the review. I would love a chance to win the halo. I would love to try it. Thanks for the chance. I am still working out how to FMQ with confidence. Thanks for the review (and chance to win). Thank you for the review. I just got something like it but they are square with and opening on one side. There are two different sizes. I will try them out as soon as my husband finishes my new sewing table :D .
Good review.I am pretty new to machine quilting, it seems this would be a handy tool, but wonder if it could be an "open circle" allowing for it to be removed from the machine without cutting thread, would it lose it's rigidity. I would like to try this. Thanks for a chance to win! I have never tried this tool. Don´t even think I can buy it in Denmark. I would love to try quilting using the halo! This looks interesting! I feel like I have to move my hands around an awful lot - maybe this would help. I would be willing to try it out! Oh I would Love to wins Quilt Halo. I have been wanting to try it for months(maybe a year) now. Thanks for the review and the opportunity to win one. Thanks for the great review! I;d love to try one out! I'm not all that comfortable with machine quilting, so this would be a help! I have been thinking about ordering one of these Quilt Halos but have been put off by the price. So I'll try my luck here. Thanks for a great review. I would love this! 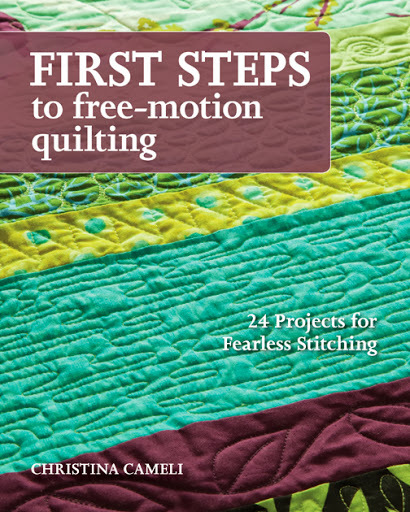 I am still a novice @ free motion quilting-was actually finishing up a baby quilt today, and sure would have liked to try it! Thanks for the chance. I'd love the opportunity to try out the quilt halo, Christina. Thanks for counting me in. Looks like an interesting gadget! Thanks for the chance to win one!! Great review I agree with hearing the pros and cons being more helpful. Halo sounds like it would be a good fit for me in keeping my hands relaxed and then maybe my shoulders lower then my ears! Thanks for doing another good giveaway. I actually own 2 of the Halos. I stack them one on top of the other. I don't use them often as I have a long arm, but for me, I actually like that the Halo gives me 'boundries' while I'm quilting. As for getting to the edge of the quilt and using your hands, I 'hang' the halos over my machine - just slip them up over the head. Very interesting. I wonder if it would be good for a beginner? You mentioned someone with joint problems and people that weren't satisfied with their grip on the quilt. I was looking for something like that a while ago to see if it would help me. Thanks for the review. I am very interested. I had looked into it before. I have a bad shoulder and can only quilt for about 30 min at a time. I was thinking the relaxed hand might help and give me a little more time to quilt. I've tried one before and like it, but don't have one. Thanks for the review. I'd like to give it a try. Never heard of this but your review makes it sound like a 'must-have'. Thanks for the chance to win. 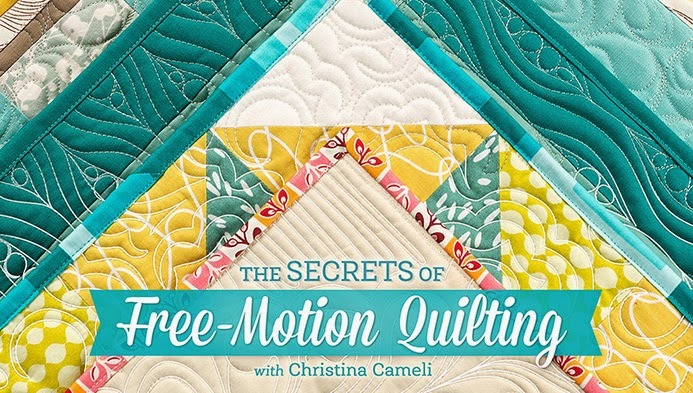 I think this would definitely help my free motion quilting attempts! Thanks for the chance to win! Thank you so much for the review. I have been trying to find some tools to help me improve my FMQ. All the teachers say practice is what helps the most and I know that is true. But a new tool wouldnt hurt right? Thanks for the giveaway. I have seen these lots of times in the stores and have wondered if they work and are worth the investment. I really appreciated your review of it, because I've never seen one, nor have I talked to anyone who has used one. Thank you so much! 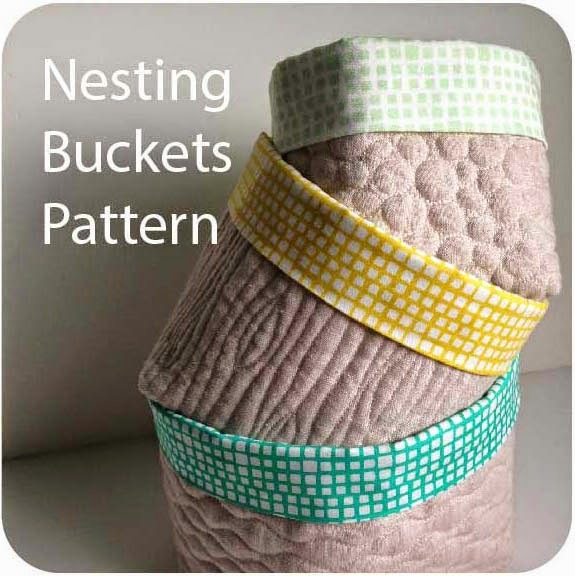 I would love to give the quilt halo a try. Thanks for a chance to win! Great review! I'd love to try it. I would love to try the Halo. Thanks for the giveaway. I'd been curious about this thing when I saw it in the store, now that I've read your review I'm even more interested in trying it. It seems like the quilt halo would be a good idea for the people who believe gloves make them feel less in tune with their quilting..
Great review on the Quilt Halo. I don't need one - I'd just like to add my two cents to your review. I ordered one online a while ago and had to have it replaced because it was "defective" - the joint was bumpy - the red rubber coating was lumpy - and it was "tweaked" so it didn't lie flat on the machine bed. Can't use it if it doesn't lie flat! After I got the "replacement" (at no charge) - and played with it - my reaction very much like yours. OK - but not exactly right - and a bit expensive to boot. And - like Katie M. - I also "hung" it on the head of my sewing machine when it got in the way. Interesting toy - but sometimes the gloves just work better. Go figure. I'd love to try a Quilt Halo. Interesting...I noticed one of these today at my favorite shop...would love to win one to try out. I, too, have wondered about it, if it would actually help my quilting. I'd love to win it, thanks for the opportunity. Great review! I have been curious about those. This looks like a fun thing to try. I have the same trouble as you, but I cannot blame the kids as they are not allowed to play in my sewing studio for security reasons (they are welcome when we sew together as I can control what they do! )- the only person I can get angry at about moving around stuff I need quickly, like my quilting gloves. But I am not sure that a Halo would solve that problem for me, I am a professional "mislayer". I would like to give this a try. This is something that I have wanted to try...would love to win. Thanks for the opportunity. What a cool tool!! I'd love to give it a try. I've been working through your FMQ tutorial and love it. I am finally ready to actually try it on a quilt. Thank you for all the help you've given me! Photos/text by Christina Cameli. Most rights reserved. See About Me page for detailed information. Powered by Blogger.